Welcome to the Information Age – the age of talking to someone on the other side of the world in real-time through your device’s screen; the age of storing hundreds of gigabytes for easy access without using a hard drive; the age of trading stocks on your smartphone. Over the course of a decade alone, the perception of a mobile device has changed completely from mere utility, used only to call and send texts, to an indispensable device connecting a user to the rest of the world through email, social media, search engines, mobile apps, web entertainment, and a close-to infinite number of other mediums of information sharing. Nowadays, people don’t just want a mobile device; people need a mobile device. Research shows that people experience low battery anxiety when a phone is close to or already has died. In a study conducted by LG, 9 out of 10 people start to panic when losing power on their phone. It seems kind of silly, but unless you’re a part of that 10%, you’re going to start scurrying for a phone charger when your phone hits the red icon. How Can Businesses Solve This Problem For Customers? As a business, your customers are your life-line. Without them, it’s impossible to establish a successful business. Think about how you’re currently working to solve your customers’ problems, and think about how this situation could be a problem for customers at your particular business. By ignoring your customers’ problems, you’re making your business or event one that’s easily forgettable. But by offering a charging solution, you can help solve this issue for customers. Solutions like cell phone charging stations make it easy for customers to charge their phone, and there are a lot of benefits that most businesses don’t realize. Just like that, a dead phone can end your customer’s night. If your customer has to send an important e-mail, access the web to review your business, or is expecting an important call, a low or dead phone battery could compel them to leave prematurely. On the other hand, your venue could offer a phone charging station, allowing your customer to take care of personal responsibilities on the spot. This helps to prolong their time spent at your venue, and focuses their attention away from their phone’s battery making them more engaged customers. Any time you can increase your customers’ a) time spent at your location, b) customer retention and c) engagement, you’re going to increase the likelihood that these customers spend more. If they have to leave prematurely to go find a place to charge their phone, then you’re already missing out on lost dollars. Overall, research has found that customers that charge their phones will spend 29% more than customers that don’t. Because people know that they can charge their phone at your location, they’ll rely on you for it. Restaurants, bars, hospitals and sports events are all examples of beneficiaries. Local restaurants will be the place people go to charge their phone on lunch breaks, and bars can attract people that need to charge their phone before continuing on through the night. As far as hospitals and sports events are concerned, it’s more about positioning. By having charging stations located in eating areas, you can attract visitors to areas where they’ll make a purchase. Not every business offers a phone charging station because many businesses feel that there is no direct ROI. They don’t see the benefit in it, but instead of focusing on how it will increase revenue, you should be focusing on how your customers would appreciate it. Offering a phone charging station helps improve a customer’s overall experience because they’re more engaged, and by improving their experience, you can make them more loyal customers. Gary Vaynerchuk, a world-renowned entrepreneur, discusses how the best marketing strategy is to care, and says that many businesses fail because they’re too profit-driven. Buying or renting a charging kiosk will also attract fresh new customers to your venue. If several people find themselves with dangerously low or dead phone battery levels over various parts of the day, they will be desperate to get to the closest charger. Once the buzz that your venue is offering a charging station gets around town, guests will be drawn in regardless on whether or not they had originally planned on using your product or service. The other day, I was at the mall when I needed to charge my phone. I asked an employee at the store I was working at if he knew of a place where I could charge my phone, and he said there was a place a few stores down that had a charging station. While I didn’t purchase anything in the store, it did get me through the door as I’m sure it got others through the door. For trade shows and retailers, being able to attract new customers that wouldn’t have otherwise visited your location is important. Whether it’s at an event or for your own location, you can buy a custom branded phone charging station as a way to increase brand awareness and recognition. 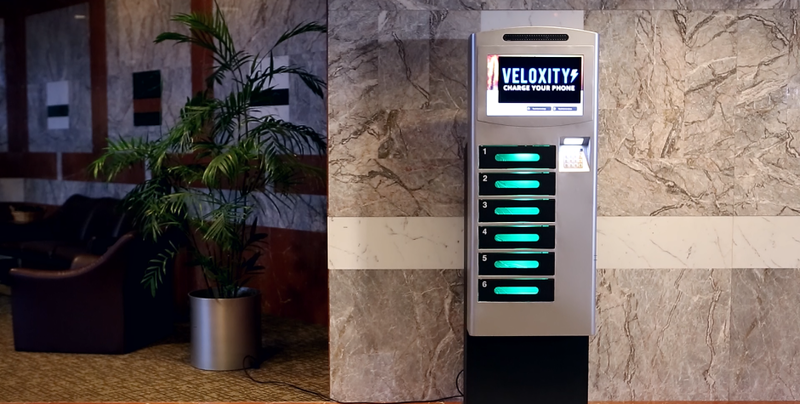 We’ve helped customers accomplish their branding goals by building charging stations that represent their brand. 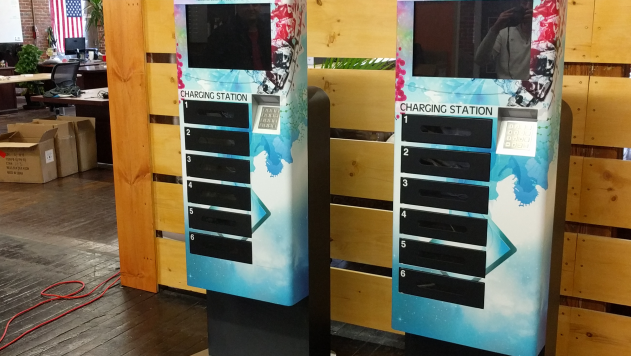 Events and venues that are looking for ways to increase profits can use phone charging stations as a sponsorship opportunity. 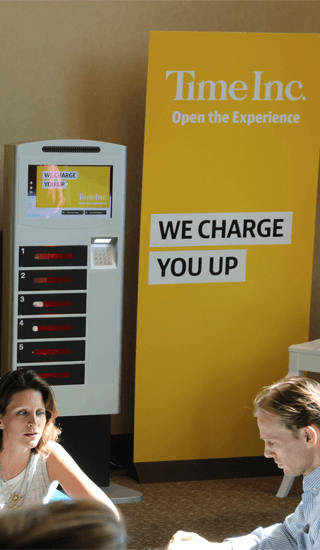 If you’re not interested in purchasing a branded charging station yourself, you can use it as a selling point for companies to accomplish their own branding goals at your venue. As mentioned earlier, charging stations solve a problem for customers. They’re a solution to low or dead phone battery anxiety and in a world where everyone is using their phones, consumers will start to rely on businesses to have a solution for this problem. When businesses can’t provide a way for people to charge their phones, they’ll leave and look for somewhere that they can. As you can see, there are a lot of reasons why businesses should purchase a phone charging station. All of these benefits help businesses establish a competitive advantage, and we’ve seen firsthand how it can help a business improve. How Are We Different From Competing Brands? The biggest benefit of buying a phone charging kiosk or even a portable charging station is that they support 98% of smartphones on the market, as well as tablets and laptops. So we’re not just offering phone charging stations, we’re offering multi-device charging stations. Our charging stations also offer remote access (which many brands don’t), an environmentally-friendly option, usage analytics, and a secure place to charge their phone. Almost all of the competing brands in the market aren’t able to the same.